More than one in four drivers don’t perform regular tyre pressure checks, according to new research from the AA. The breakdown recovery firm canvassed 20,000 of its members and found that 27 per cent of drivers admitted to not checking their tyre pressures over the past two months. Almost one in 10 said they never checked their tyres pressures at all or hadn't done so in the previous six months. Underinflated tyres are linked to a broad range of problems, with the uneven contact on the road resulting in excessive wear and an increased risk of puncture. Fuel economy can also be heavily affected by tyres that are not inflated correctly, with the increased rolling resistance forcing the engine to work harder and use more fuel. Overinflated tyres can be just as dangerous, with the tyres having a smaller contact area with the road, resulting in oss of traction, increased braking distances and a higher risk of skidding. “Failure to make these checks even after a couple of weeks can have significant knock-on effect to your fuel economy and the comfort of your drive – and not least your safety," said Mark Shankland of the AA. "It’s important to check your tyres every couple of weeks. Before you do, make sure they’re cold and haven’t been driven in the last couple of hours. The pressure inside your tyre naturally increases as they heat up, so making an assessment while they are warm could give a false reading," Shankland added. Faulty tyres are among the most-common causes for MoT failure in the UK, according to the Honest John MoT Files, causing more than one in 10 cars to fail its annual roadworthiness test. 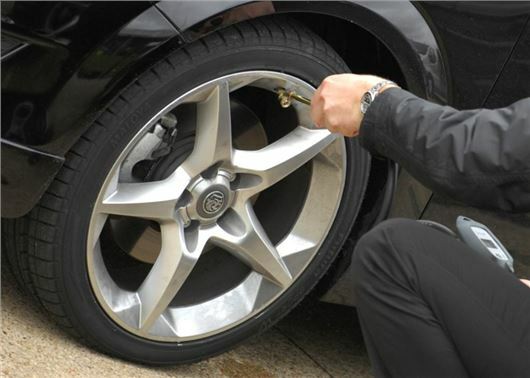 The recommended tyre pressure can often be found in the handbook or in the sill of the driver's door. According to Department for Transport figures for 2015, a third (32.6 per cent) of accidents in the UK, which vehicle defects were a contributory factor, were caused by under inflated, defective or illegal tyres.